The Chevrolet Silverado Cheyenne Concept truck begins with a 2014 Silverado regular cab/short bed pickup powered by the EcoTec3 6.2L V8 that delivers 420 horsepower and 460lb-ft of torque to the rear wheels via a 6-speed automatic transmission. That makes this Silverado one of the most powerful trucks on the road today but helping to improve the overall performance, the GM engineers cut about 200 pounds out of the truck by replacing the standard tailgate, bumpers and the inner cargo box with carbon fiber components. In addition to these components being lighter than the standard parts, the appearance and aerodynamics of this mean looking concept truck have been improved with a ground effects package, an integrated tailgate spoiler and a Z/28 custom hood. Once the weight of the Chevrolet Silverado Cheyenne Concept truck was reduced and the body was given an aggressive, sport look the engineers took to other areas of performance. 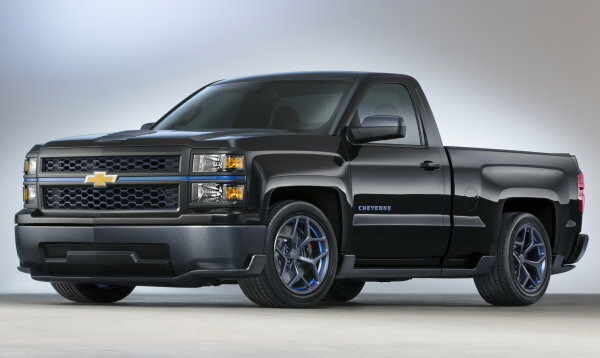 The Cheyenne Silverado Concept wears massive Z/28 carbon ceramic brakes, charcoal painted lightweight Z/28 wheels wrapped in high performance rubber, a sport tuned suspension featuring composite rear leaf springs that improves the handling while also lowering the ride height and a lightweight aluminum driveshaft to allow this truck to perform well in any setting. On the inside, the Chevrolet Silverado Cheyenne Concept sports a seat or race-bred Recaro bucket seats and a flat bottomed sport steering wheel similar to the one found in the Camaro ZL1. “Elements such as high-strength steel in the frame and body structure are found on all production models, while some also feature aluminum suspension components, contributing to the Silverado’s everyday performance. With the Cheyenne concept, we’ve taken the low-mass concept to a new level – with exciting results,” said Perry. While this truck is just a concept right now, it should be noted that there are very few aspects of the Chevrolet Silverado Cheyenne Concept that couldn’t show up in a production go-fast truck. The Z/28 components including the brakes and wheels are already available in the company portfolio and the same is true of the steering wheel and seats. The sport suspension package could easily be adapted to work for a production pickup and many of the physical modifications could arrive on a production model to allow it to stand out from other regular cab, short bed Silverado 1500 pickups. It seems unlikely that Chevy would roll out a truck with so much carbon fiber as that would drive the price of the final product way up but if GM looks to target the deep pocketed buyers who would want to drive this truck when their Corvette or Camaro ZL1 is parked for the winter, it isn’t totally out of the question that many aspects of this truck could arrive in American dealerships in the not so distant future. Yes Chevy bring back the boss Hogg of trucking. The Ford and dodge will try to pick up where you left off at. I would buy one and the 2015 Corvette stingray z06 too.